Pavements are designed, constructed, and maintained to provide adequate support for loads imposed by traffic, and to provide a uniformly firm, stable, smooth, all-weather surface. To achieve these objectives, the subgrade, base, underdrainage and pavement must function together properly so that the pavement will not fail under the predicted traffic loads. Pavements are either flexible or rigid. Flexible pavements consist of a mixture of liquid asphalt and aggregate. There are three general categories of asphalt pavement design. Selection is based on traffic volume. Plant Mix Surface Leveling mixes are our least stable mixes and are used only on lower volume roads where rutting is not expected to be an issue. The general requirements for this mix type can be found in Bituminous Surface Leveling. Plant Mix Bituminous Bases and Pavements have higher stability requirements than surface leveling and are used on medium volume roads. The general requirments for these mix types can be found in Bituminous Base and Pavement. 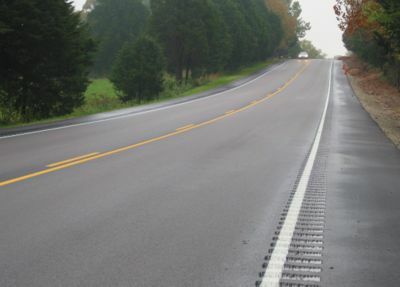 Superpave is the most stable of all asphalt pavement types and is used on the highest volume roads. The general requirements for Superpave mixes can be found in Asphaltic Concrete Pavement. This page was last modified on 23 July 2018, at 11:32.